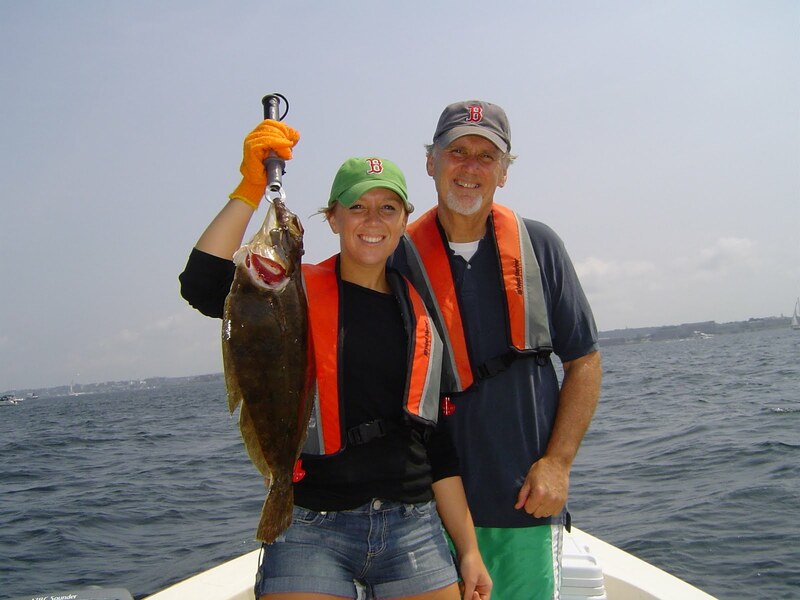 Jay Conway (right) and daughter Jennifer Conway (left) with the seven pound fluke she caught on the south side of the Newport Bridge while fishing in 75 feet of water. She was using a conventional squid rig tipped with fresh squid, fluke belly and a freshwater minnow. 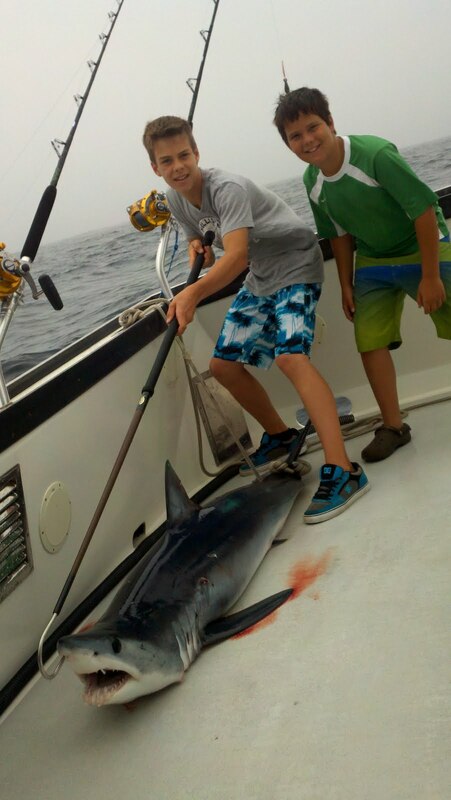 Ian O’Hara (left, 14 years old) and brother Carlin (right, eleven years old) both from Cranston each caught a 150 pound Mako shark while fishing off Block Island last month. Who knew? Who knew that someday even the fish you eat would have an ID number… a bar code? Well the fish you buy at a specialty market or eat at a fine dining establishment just may have an ID number if it is part of the fresh fish “Trace and Trust” initiative. This number will tell you when, where and on what boat that fish was caught. There is even a Facebook link you access with your smart phone from your restaurant dining table that tells you a little bit about the fish, how it was caught and the captain and crew that caught the fish. Wild Rhody communicates with chefs at fine dining establishments (often while they are out fishing) to find out what they have in mind to cook for dinner and then they catch and supply that fish to the restaurant. Conversely, Wild Rhody partners take the initiative and call restaurants letting them know what they are catching so chefs can plan accordingly. What’s the end result? Fishermen get more for their catch as it is sold direct, restaurants get more for their entre too (as the fish is guaranteed fresh), chefs get to cook and serve fish fresher than ever before and most important the customer gets a fresh local fish (guaranteed by its identify code) expertly prepared by their favorite restaurant. Everyone wins. As an avid recreational fisherman, I find a lot of comfort knowing that I can now get fresh fish when dining out through Trace and Trust. Find out what restaurants and specially markets are working with Rhody Fresh by visiting their web site at www.traceandtrust.com . Jigging for striped bass and more will be Capt. Jack Sprengel’s topic Monday, August 29, 7:00 p.m. at the monthly RISAA meeting, West Valley Inn, 4 Blossom Street, West Warwick, RI. John Fulweiler, Esq. will also speak on maritime law for recreational boaters. RISAA members free, $10 donation for non-members. Optional dinner from 5:30 to 6:30 p.m. at reasonably prices served by the West Valley Inn. The Rhode Island Marine Fisheries Council (RIMFC) met last week with five new members and I am honored to say that I am one of them. The Council consists of eight members, three for the commercial fishing community, three from the recreational fishing and two from the scientific community. Council members were appointed by Governor Lincoln Chaffee and confirmed by the State Senate last month. The purpose of the Council is to advise Janet Coit, director of the Department of Environmental Management (DEM), on regulation as it relates to both commercial and recreational fishing in Rhode Island. The Council is chaired by Robert Ballou, acting director of DEM’s Marine Fisheries Division. The three council members who have served before are Richard Hittinger (RISAA vice president, who was elected vice chair at the meeting), Richard Bellavance, president of the Rhode Island Party & Charter Boat Association, and Dr. Christopher Anderson form the University of Rhode Island. New council members are Kenneth Booth, president of the Commercial Rod and Reel Fisherman’s Association; Will Mackintosh, III, commercial fisherman; J. Christopher Powell from Roger Williams University; Jeff Gant, president of the Rhode Island Shell Fisherman’s Association; and David Monti, charter boat captain and fishing columnist. Last week’s meeting primarily served as an orientation meeting for new members and an organizational meeting for the Council. Meeting schedules, agendas and meeting minutes are all a matter of public record and can be found on the DEM Marine Fisheries’ web site at www.dem.ri.gov . The Mid-Atlantic Fishery Management Council, which regulates summer flounder, recommended increasing the 2012 harvest by 1.6 million pounds to 35.55 million pounds, at a meeting last week. The proposed harvest for 2012 is a 125 percent increase over the lowest year, the 2008 quota of 15.77 million pounds. The recommendation, still has to be approved by the National Marine Fisheries Service and then Rhode Island will establish its recreational and commercial regulations based on the approved quota. Striped bass fishing remains strong at the North Rip and southwest side of Block Island. Fishing in front of Newport, along coastal shores and in Narragansett Bay for striped bass has been very slow. Richard Beretta reports a slow bite off Newport when fishing with his family Sunday, “We had one bit using eels and that was it.” However, a good amount of bait has been reported off Jamestown, Newport and in the Bay (even the upper Bay) so this is a good sign for the fall bass run. Will have to wait and see. Fluke fishing was mixed this past week. John Owens on the RISAA blog reports catching twenty shorts and five keepers under the Newport Bridge last Saturday. Jennifer Conway of North Kingstown caught a 25 inch fluke at seven pounds (her first fluke trip) Sunday while fishing with her father Jay Conway on No Fluke Charters. Fluke fishing at the mouth of the Sakonnet River, Elbow Ledge and off Point Judith has been slow this week with mixed results… a lot of shorts. However, fluke fishing activity has picked up a bit along southern coastal shores from Watch Hill to Point Judith. 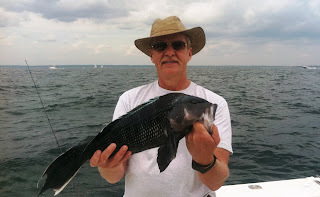 Captain Rich Hittinger reported a good fluke bite with sea bass mixed in off Charlestown last week. Captain Hittinger said, “This is an improvement from what it has been there.” Reports of squid moving back into the area. Bluefish bite off Block Island is good with fish on the surface this past Sunday at the Southwest Ledge. Blues were on the surface a Sakonnet Point Sunday as well. Not many bluefish reports in Narragansett Bay. Jim Malachowski of Cranston (with his nephew on board) said, “We had a difficult time finding bluefish Sunday in the West Passage in the Hope Island, Jamestown and Quonset Point area”. However, just as with striped bass, the reports of a lot of bait in the Bay and along coastal shores is a good sign for fall blue fishing too. Ken Ferrara of Ray’s Bait & Tackle, Warwick said his customers were catching bluefish around Halfway Rock and Gould Island trolling with striped bass mixed in. 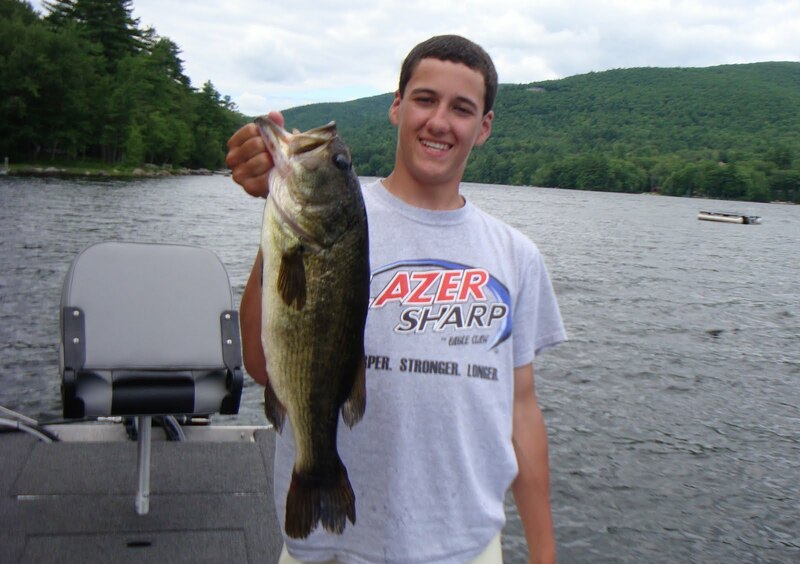 Chris Catucci of Warwick, RI with the five pound freshwater bass he caught in New Hampshire last week. 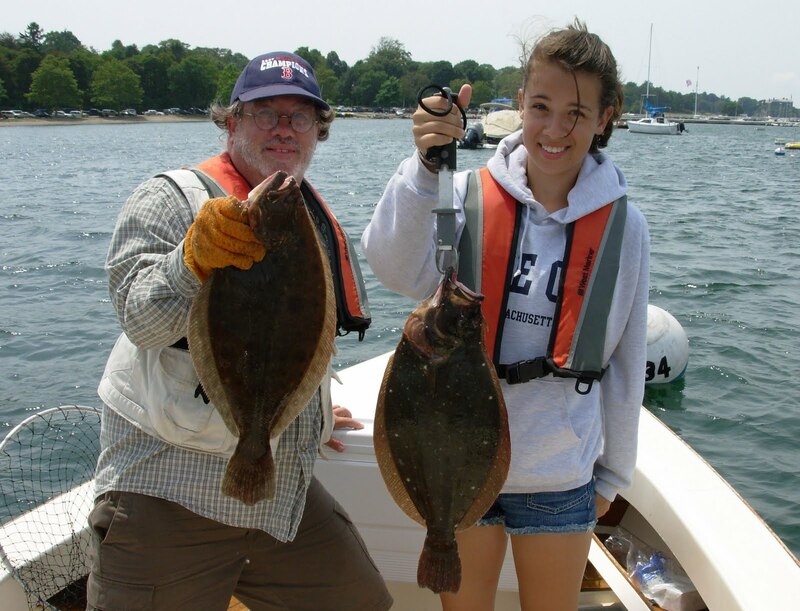 Steve Smith (left) and his daughter Rayell of Waterbury, CT with two of the twelve fluke (summer flounder) they caught at the Newport Bridge while fishing No Fluke Charters. The crew of the charter boat Hot Reels lays the massive 534 pound swordfish on top of the “Coffin Box” with the bill and tail hanging out either end. They normally fit two large sized tuna in this fish box. Captain Louis DeFusco with the 434-pound record swordfish he caught while fishing on his character boat Hot Reels. The fish, which beat the old Rhode Island record by 120 pounds, took three and a half hours to land. 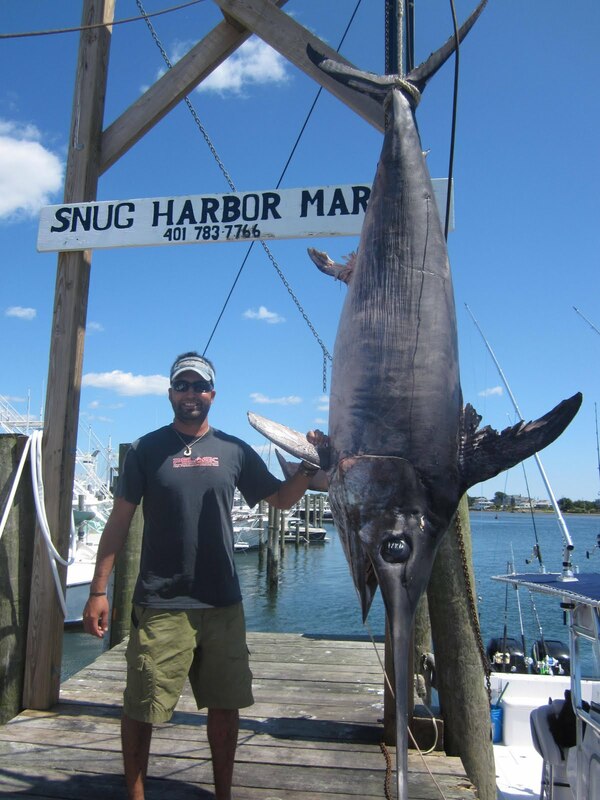 “The first midsized giant bluefin of the season was caught last Saturday weighing 263 pounds.” said Elisa Jackman of Snug Harbor Marina in South Kingstown. The bluefin was caught at the Mud Hole by Frank Busher of Portsmouth, RI aboard the vessel Bushwhacker. It is hoped that this is the first fish of many for the season. 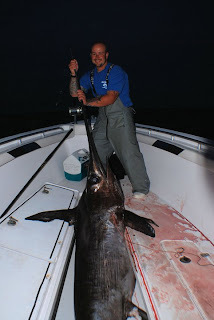 Jackman continued to say, “The record breaking 434 pound broadbill swordfish caught last Thursday by Captain Louis DeFusco of West Warwick, RI fought for three and half hours.” The swordfish was caught at the Hydrographer Canyon aboard his charter boat Hot Reels which is out of Point Judith, RI. It broke the Rhode Island record by 120 pounds which was held by Web Goodwin of Warwick who caught a 314 pound swordfish in 1964. NOAA scientists are carefully evaluating the new preliminary estimates to provide an in-depth analysis of the numbers and gain a better understanding of their implications. The Atlantic States Marine Fisheries Commission (ASMFC) Tautog Management Board accepted a Massachusetts and Rhode Island plan that may mean we will not need to take a reduction in tautog for the 2012 season. Removal of the Pawtuxet Falls dam is underway. The contractor, SumCo, is preparing the staging areas. The project received preliminary approval last week from RIDEM regarding water control plans. This will be the largest dam removal project in the state's history. The $600,000 project is a collaboration between state and federal agencies and non-profit organizations like the Pawtuxet River Authority and Watershed Council. The dam removal is intended to give fish species, such as American shad and river herring, better access to their historical spawning areas. Demolishing the dam is also expected to reduce flood risks by lowering water levels in areas immediately upstream. The initiative is supported by RISAA. Striped bass. Al Conti of Snug Harbor Marina reports a good striped bass bite around Block Island with good sized fish being taken at the north rip and the southeast and southwest sides of the Island. During the day fish taking diamond jigs on wire and at night eels are the bait of choice. Striped bass fishing in the Bay is actually improving. Mike Swain of Coventry said he and fishing partner Darrell Hatten were fluke fishing at Conimicut Point and cauth a 33 inch striped bass while fluke fishing. John Littlefield of Archie’s Bait & Tackle of East Providence said, “Customers continue to catch bass using worms at Sabin Point, I’ll bet 30 to 40 fish were caught in the past three or four days.” Both Mike Swain and John Littlefield said schools of menhaden have appeared in the upper Bay this past week. This is a good sign for fall fishing. Scup bite excellent at the bridges and in from shore at Colt State Park in Bristol said John Littlefield. Tuna fishing at Cox’s Ledge and beyond is still mixed… some days good… other days not so good. Winners of the Lions Club Visually Impaired Persons (VIP) Fishing Tournament were (left to right) Janice Musco (first place), Lincoln, RI; Norman Boyce, Bristol, RI (second place); and Gerardo Cerino (third place), Providence, RI. Peter Sousa of Warwick, RI with a fluke he caught on No Fluke Charters off Point Judith this weekend in 55 feet of water using a conventional squid rig tipped with squid, fluke belly and a freshwater minnow. Captain Rich Hittinger out of Point Judith, RI with a black sea bass he caught this past Sunday off of Point Judith Light in Narragansett, RI. The bluefish column last week got quite a few responses. There are bluefish fans out there. Select comments appear below, bluefish recipes to follow next week (please share your favorite recipes). One request from Chris Del Sesto of Cranston was actually a question… “Where do they serve bluefish?” So if you know what restaurants in RI or MA serve bluefish, let me know and I will pass the information along. Chris Del Sesto and Donna Lee, Cranston, RI. “Dear Dave. Glad to see you’re giving bluefish their due. I am eighty three and have been fishing for them since I was a kid in Jamestown. I agree with you completely concerning both their fighting ability and their culinary desirability. My fishing buddy these days is my 14 year old grandson and he would rather catch blues than anything else he has tangled with so far in his young life including plenty of Penobscot River smallmouth. I have two excellent books on bluefish; I am sure you are familiar with John Hersey's "Blues", I also have "The Bluefish Cookbook' by Greta Jacobs and Jane Alexander which my wife picked years ago when we were on a visit to either Nantucket or Martha's Vineyard. I don't know if either are still in print. 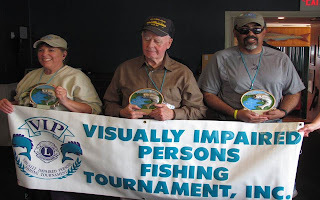 The Rhode Island Lions Sight Foundation’ 4th Annual VIP Fishing Tournament for the blind and visually impaired was held Sunday, June 26, 2011 aboard “The Lady Frances” party fishing boat in Galilee, RI where the participants were competing for several trophies. The fishing tournament was followed by a buffet lunch at George’s of Galilee Restaurant in Galilee where the participants enjoyed lunch and the winners’ trophies were distributed. First Place was taken by Janice Musco of Lincoln with a total of 76" of fish, thanks to a very unusual catch of a 30' Bluefish. Second Place was taken by Norman Boyce of Bristol with a total of 75" of fish all Fluke. Third Place was taken by Gerardo Cerino of Providence with a total of 68.5" of fish all Skate. The Rhode Island Lions Sight Foundation would like to send the top three winners of the tournament to compete in the National VIP Tournament on the Outer Banks of North Carolina in October, as they have the last three years, if the funds can be raised to allow it. If you would like to make a donation to help fund this event or would like information on the RILSF VIP Fishing Tournament please visit our websites at www.lions4sight.org and www.ncvipfishing.org . Striped bass fishing continues to be good at Block Island at the North Rip and on the Southwest Ledge. Fish being taken on tube and worm, umbrella rigs, eels and jigs. This past Sunday activity in both places was good early in the morning but by 10:00 a.m. activity slowed dramatically. Some striped bass activity in Narragansett Bay this week. Joe Petuli reports on the RISAA blog he took, “Five bass to 36" on the east channel edge off Barrington beach last week (fish were taken during the) last hour of the incoming tide. (fish were caught using) Rubber shad frames off downriggers. Only one fish was short.” The Francis Fleet reports an excellent striped bass bite on its night trips. Fluke (summer flounder) fishing remains strong. 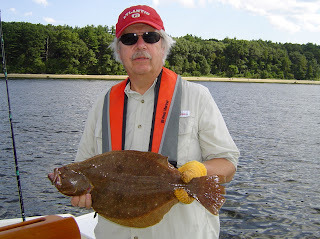 Captain Rich Hittinger reports a reduced fluke bite off Point Judith, however there are still fish there Rich reports. Peter Sousa of Warwick caught keeper fluke Sunday while fishing off Point Judith in 55 feet of water using a conventional squid rig tipped with squid, fluke belly and a freshwater minor while aboard No Fluke Charters. Ken Landry of Ray’s Bait & Tackle, Warwick, reports landing several fluke at the mouth of the Sakonnet River Sunday. The largest fish taken on his boat was ten pounds. The Seven B’s reports a good fluke bite last week with sea bass mixed in. The largest fish for the week was 8.5 pounds. Some customers reached their seven fish fluke limit. Black sea bass bite is good. Anglers catching keepers mixed in with shorts while fluke fishing. Captain Rich Hittinger said he caught some nice keepers off Point Judith this past Sunday. Bluefish bite off shore around Block Island has been good, often creating problems for striped bass anglers. Anglers continue to find bluefish in the West passage of the Bay between Hope Island and Greenwich Bay.